Samaritan’s Purse is conducting the first intensive graduate level humanitarian aid course designed and implemented by non-governmental organization practitioners for practitioners and taught from a Christian perspective. The course is designed to train international relief workers in technical skills needed during disaster response and to provide them with an overview of humanitarian aid. Training will include pre-readings, lectures by experts, group tabletop exercises, field exercise, and live full-scale simulations with role players. 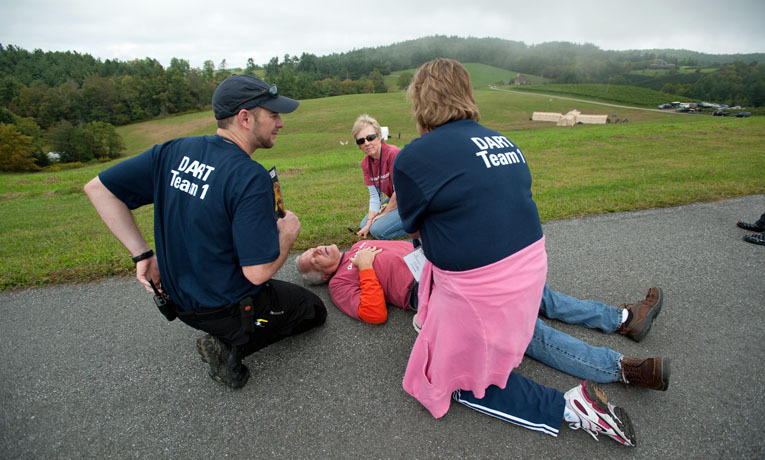 The course is designed for students who have completed Samaritan’s Purse Disaster Assistance Response Team 201 Training, demonstrated an identified capacity in disaster relief, and served on at least one previous DART with Samaritan’s Purse or has worked as Samaritan’s Purse international field staff for a minimum of six months. We need volunteers to play the roles of victims to help relief workers know what to do when a disaster happens. Volunteering will give you a glimpse into the life of a victim, a picture of Samaritan’s Purse response, and a chance to train some of the top relief workers. Wednesday, April 24 10:30 a.m. – 5:30 p.m.
Thursday, April 25 6:30 a.m. – 3:00 p.m.
Saturday, April 27 6:00 a.m. – 3:30 p.m. If you would like to apply to volunteer, please contact Betsy Gaskamp (704-916-8006 or bgaskamp@samaritan.org) or Darenda Mason (704-916-8008 or damason@samaritan.org).